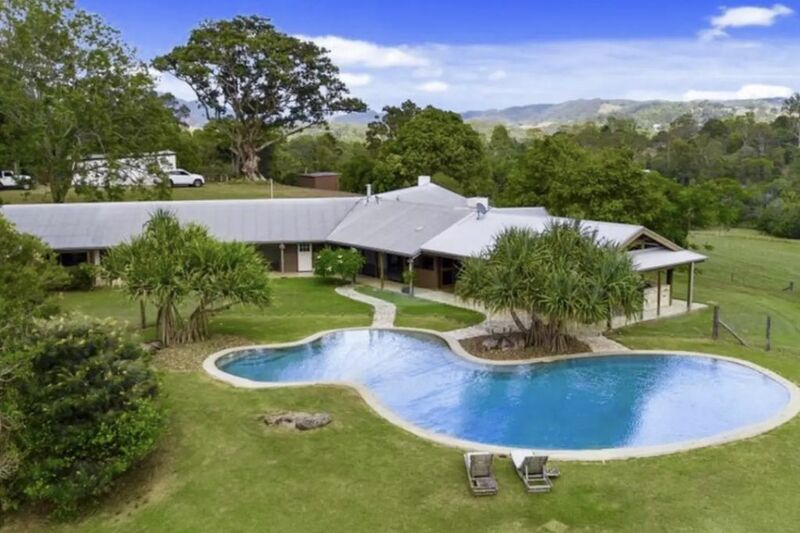 In the famous Noosa Hinterland, this spacious farm homestead is beautifully appointed with a private resort-style pool, everything you need for a peaceful and restorative Sunshine Hinterland retreat. Situated just 90 minutes North of Brisbane, and only 15 minutes from the famous Noosa Heads beaches, 5 minutes to the Eumundi markets and Brewery, and 3 minutes to Cooroy township. This gorgeous farmstay home retreat is the perfect spot to relax and enjoy tranquillity and stunning mountain views. 38 secluded acres with spectacular 180 degree views. The house is cosy and modern with 3 bedrooms and 2 bathrooms, capacity for 9 people to stay comfortably. The property runs on pure spring water, supplied by the Cooroy Mountain Spring. The front entrance flows through to a large kitchen/dining area and lounge room equipped with 2 fireplaces. Step outside to a gorgeous resort style pool overlooking the dam and the majestic Mount Cooroy. Cows, horses and the occasional kangaroo can be seen from your peaceful spot on the verandah. Spend the evening sitting by one of two open fires really get the feel of country life . Dine on the cabin-like verandah overlooking the view. Visit vibrant, bustling farmers markets in Noosa or Eumundi on the weekends, or enjoy a cold beer and burger at the stunning Copperhead Micro Brewery in Cooroy after hitting the magnificent beaches in Noosa. This house has everything you need to make your holiday a peaceful retreat to connect with nature! Local area: Eumundi is 20 km south-west of Noosa Heads in the Sunshine Coast Hinterland. It's is the place to discover talented visual artists, a thriving live-music scene graced by both local talent and international performers as well as renowned galleries, studios and theatres right across the Sunshine Coast. Eumundi is a refreshingly lush and hilly Noosa hinterland shopping village that mixes a historic Queensland village atmosphere with a modern and very vibrant arts community all centred around the famous Eumundi Markets. Under the most magnificent heritage listed fig trees, you will find hundreds of colourful stalls at The Original Eumundi Markets as it comes alive each week with artists, food producers and performers sharing their talents and goods with visitors. Spectacular views of Mt Cooroy, Mt Cooroora, Mt Pinbarren, Mt Timbeerwah, Eerwah Vale and surrounds. Stunning property, highly recommend. Best holiday ever!! The beauty of this property blew me away!! Picturesque views from every location, I couldn’t be happier with my holiday. Lauren was very easy to talk to, and made our stay very welcoming. We will dfinately be coming back - 6 days was not long enough. Highly recommend this property!! Fantastic outlook, perfect family getaway! Will definitely stay here again. Loved loved loved this home. Stunning location with beautiful sunsets over the mountain. Has everything you could possibly need for your stay. Friendly and helpful owners. Feels like your miles away from anywhere but really only a short drive from restaurants and shops. Would recommend this property to anyone looking for a relaxing time! !